Dropping the Bomb: War Crime or Necessary Evil? Every year, on 15th August, the world stops and reflects. Not only are the deaths of tens of thousands of people mourned for, but the decision that caused them is debated – whether the US was ethically justified in dropping two nuclear bombs on Hiroshima and Nagasaki. The world was soldiering towards the end of a dark period of human history that had seen the worst ever conflict, with around 70 million people dying in total during WW2. Historian Robert Newman concluded that each month that the war continued in 1945 would have caused deaths ‘upwards of 250,000 mostly Asian people.’ This led to a debate on how to end the war through Japanese surrender. It was framed as binary: invasion on Japanese soil or bomb them to submission. It’s believed invasion would ultimately cause far more deaths due to the ancient warrior traditions ingrained in Japanese culture, which consider military surrender to be extremely dishonourable. It was believed Japan would not surrender unless there was an overwhelming demonstration of destructive capability. Ending the war would also limit the expansion of the Japanese controlled Vietnamese famine of 1945, bringing an end to 1–2 million deaths, as well as liberating millions of civilian labourers and Allied prisoners of war. These reasons provided a strong incentive for the US to end the war as quickly as possible. By choosing to use nuclear weapons, they adopted a stance that limited casualties in the war on both sides, and forced Japanese surrender. The death tolls in Hiroshima and Nagasaki were a small price to pay than the greater loss of life anticipated under an invasion. Within a utilitarian framework, the bombings were essentially an act of humanity, justifying the decision. Aristotle believed the virtuous option was between the two extremes of deficiency and excess. However, this virtuous option is ultimately dependent on the circumstances of the situation. In wartimes, morality is a luxury and some rules of ethical standpoints prove impractical. For Truman in this case, the extreme of excess would be the US deciding to annihilate Japan, completely destroying the country and its inhabitants. The extreme of deficiency would be a gruelling close-quarters warfare with Japanese soldiers, resulting in the loss of many American troops needlessly, as well as a far greater number of Japanese. That argument resonated with a war-weary America at the time and it would have been hard for Truman to justify to the American public why he prolonged the war when this weapon was available. It should be noted that neither city was just a civilian target. Hiroshima was Japan’s western military capital, home of munitions factories and Nagasaki was a key port. Truman was making the virtuous decision, choosing to protect the troops of both nations and end the vicious war. Robert Newman stated “There can be justified terror, as there can be just wars”, and ending the war this way was a necessary evil. 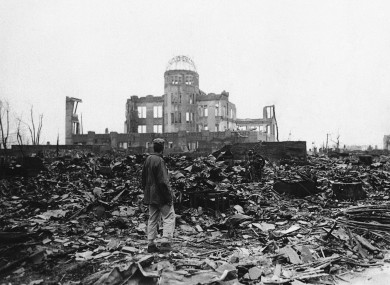 The simplified argument that use of nuclear weapons limited overall casualties – by shortening war against the surrender-dishonouring Japanese – is justified according to utilitarianism. However, this isn’t necessarily accurate. Despite this strong Japanese culture, there’s evidence to show that Japan were considering surrender before the bomb. The Allies’ Potsdam Declaration (26th July) called for unconditional surrender of Japan. However, it was deliberately left vague – for future manipulation – by the allies, especially regarding the fate of Japan’s Emperor. The Japanese revered their Emperor as a god, and would defend him indefinitely. The Americans intended on letting him stay in power, but didn’t state this in the declaration. Had this been clarified, Japan were more likely to accept the surrender. On 15th August, Russia invaded Japan, which led to surrender that same day. Some argue surrender wouldn’t have happened if it weren’t for the nuclear bombings the week before. However, there are multiple counter-arguments to this, like the US Strategic Bombing Survey, conducted after the war. It concluded that Japan would have surrendered before the planned US invasion in November. On 17th July, Truman wrote in his diary, “(Stalin’s) in Jap War on August 15th. Fini Japs when that comes about”, meaning he believed Russia would force Japan into surrender. It’s irrelevant whether the surrender would have actually occurred from the invasion alone; from the sole perspective of care ethics, it was immoral of Truman to allow the nuclear bombing when he believed that Japan would surrender anyway. There is belief that surrender could have been reached without the use of nuclear weapons, or even invasion. Thus, either of these options could be considered unethical from a utilitarian perspective, causing unnecessary deaths. If use of the bombs were to minimise casualties, they were unjust nonetheless. Kantian ethics states that moral ‘goodness’ isn’t determined by relation to a context or an end, meaning the use of the bomb was unjustified in ending the war. Furthermore, had the Axis powers used a nuclear bomb and still lost the war, it could’ve been considered a war crime. The inhumanity of the act – the vaporisation of women and children – would have demanded reparations similar to those imposed on Germany after the Holocaust. This can be considered ethically unjust, backed up by the UN’s (of which the US is a main member) Non-Proliferation Treaty of 1970, which prevents the spread of nuclear weapons and weapons technology to other countries. This is hypocritical of the US, as they’re permitted nuclear weapons under the treaty’s terms, but prevent other nations from adopting them. Regarding Kantian ethics, how can they justify the use of nuclear weapons on Japan, but stop other countries from doing the same? There is no way of knowing the outcome of WW2 if the bomb hadn’t been dropped. It’s easy to look back in hindsight, in a time of relative peace, and question the actions of our predecessors, with the knowledge we now have of nuclear warfare. Would we think differently if the sides were reversed? It is impossible to know what would have happened in WW2 had the atomic bombs not been dropped on Hiroshima and Nagasaki, so it is impossible to know if they did put an end to the war saving hundreds of thousands of lives. I think the goal of America to end the war as quickly as possible is a sound one, as I hold the opinion that an invasion would have cost far more lives on both sides. However, I think there were other methods resulting in fewer civilian deaths that could have been used. Some sources suggest Japan were closer to surrender than the Americans assumed and that a naval blockade could have been used. Another option might have been to drop a nuclear bomb on an area of low population, so the Japanese could see the military power of America and could be forced to surrender without nearly as many civilian casualties. Discussing the ethics of warfare is always a tough one, and we will never know what would have really happened if the bombs were never dropped. It is true that the bombs may have reduced the total number of deaths, but I think when this many lives are being considered it was immoral to actively kill so many. Would it have been possible to deploy a bomb on an inhabited/less densely populated area to simply demonstrate the power of the atomic bomb and force a surrender using threat alone? Many argue that the use of the atomic bombs is what finally brought an end to WW2 by provoking a Japanese surrender. In the madness and horror of war, decisions can be made that in other circumstances, and with hindsight, might seem utterly unacceptable. At the time, the US, which considered itself to be a modern and civilised nation, believed the end justified the means, and made the decision to drop the world’s most deadly weapon onto Hiroshima. Having seen the resulting catastrophic destruction and human slaughter the US then decided to do the same thing again, just 3 days later, with the bombing of Nagasaki. It was, surely, at this point that the actions of the US became morally indefensible, representing an act of unspeakable brutality and possibly even a crime against humanity. Interesting article, overall I strongly lean towards the bombing being a war crime. I think the ethical outlook of “the ends justify the means” can be a dangerous way to justify harmful actions. A very ballenced and well rounded discussion. Personally I believe that Truman’s choice to attack without any warning or demonstration of the atomic bombs destructive potential belies the fact that this was not an ethical course of action. Very thought provoking article. I definitely view the bombings as a war crime. Despite their cultural beliefs, the prospect of fighting both America and Russia would have been enough for Japan to surrender. It’s also worth considering that the Manhattan project cost $2 billion and 6 years of development. America finally had these weapons but we’re faced with the prospect of not being able to use them. I think at least some of the decision making process would have centred around America wanting to test the capabilities of the nuclear bomb, while at the same time sending a message to the rest of the world. V. interesting read, whilst the ‘for’ argument on first appearance may seem to have some level of calibre, I definitely consider the bombings to be a war crime. In reality it seems like the for argument is a bit of a facade and an afterthought excuse attempting to justify something that was inherently cataclysmic. This is a well-written article, with good points raised on both sides. I hadn’t known about the Vietnam famine before. The key question is what caused Japan to surrender: the Soviet invasion or the nuclear bombs, or both? From an ethical point of view, the utilitarian argument is used well, as is the virtue ethics argument too. Have a look at the virtue ethics argument for against. From an ethical point of view, the action that brings about the end of war quickest and reduces the level of suffering and death is preferred. The argument here is what action caused that ending. Whilst I would love to see a world without nuclear bombs, it seems too late to get rid of them now, without one global superpower taking advantage of the situation. The use of them, however, can be dealt with responsibly. Hopefully, they will never be used again. However, as the saying goes “with great power comes great responsibility”, therefore perhaps this responsibility falls into the hands of those with the power, the politicians who make these decisions, rather than the engineer who manufactures the weapons. I am against the USA dropping the bomb on Japan. I feel this was purely a political decision by America to stop Russia. There was no need to drop the bomb as there was no need to invade japan. Russia had joined the war against Japan and was winning in Manchuria. Japan had been defeated in Malaya, Burma and the Philippines and had lost Okinawa. The main Japanese islands were now being continuously bombed from the air and were surrounded by British and American ships being completely isolated. All the allies needed to do was continue this blockade as the Japanese navy and air force had no fuel and no means to continue the fight. In my view the Americans had seen the success of the Russians and felt that they would continue to take over Japanese territory and wanted to bring the war to a stop as quickly as possible to stop this happening. To do this vaporising 135000 innocent Japanese civilians was a small price to pay to prove to Russia who was the most powerful nation. I support dropping the bomb. This was the only way to save hundreds of thousands of lives possibly millions. The Japanese military and civilians had been indoctrinated into a fanaticism that they would rather die than surrender. The Japanese had already fought to virtually the last man in the pacific islands and were attacking ships with kamikaze planes. The Japanese military were not going to give up and were preparing the people of Japan to fight to the end to protect the emperor. The only was to conquer Japan would have been to invade which would have resulted in hundreds of thousands of allied and Japanese deaths. This I believe is reinforced by the fact that even after the first bomb on Hiroshima the Japanese did not surrender. It took a second bomb on Nagasaki to convince elements of the Japanese government to surrender, but even then the military wanted to continue and attempted a coup to stop the emperor declaring a surrender. Therefore although the deaths of many thousands of Japanese civilians was horrific, these two acts saved the lives of hundreds of thousands and maybe over a million others and therefore can be justified. Is personal privacy data analyzed by high-tech company reasonable?